September for many people throughout the world marks a new year for school, as well as a new ecclesial year as parish life also starts up after a long summer break. Among other beginnings – it also means that church-associated organizations also resume their regular rhythm of meetings and activities. 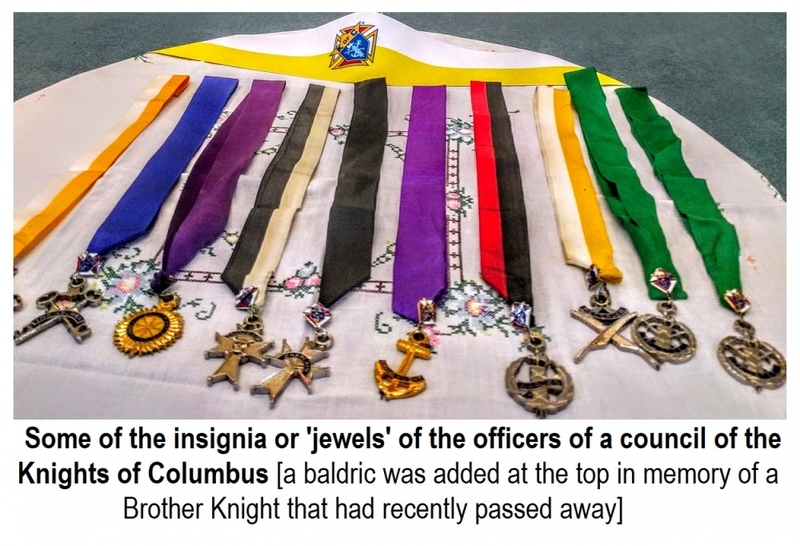 The Knights of Columbus are no exception. Throughout the province of Manitoba, local councils will be holding their ceremony of installation of officers. Some councils may hold it separately for their own council, but often all the councils of a “district” will come together on a designated evening. A district will often hold five or perhaps more councils. At St. Basil Council based out of St. 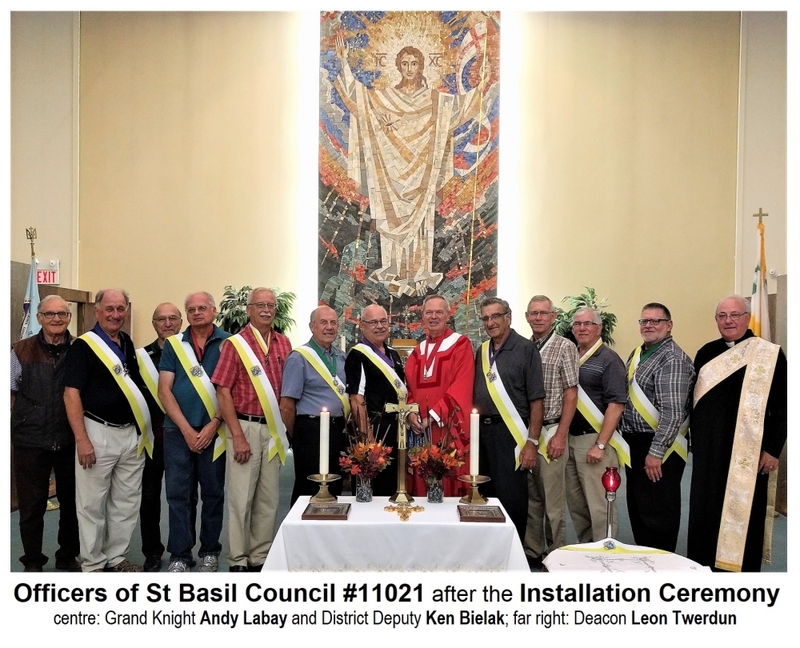 Basil the Great Parish in Winnipeg’s St. James area, they opted for having their own installation on Thursday evening, 7 September 2017. The evening began as is the custom for all their meetings throughout the year – with a Eucharistic Liturgy. Their parish priest and council chaplain, Fr. 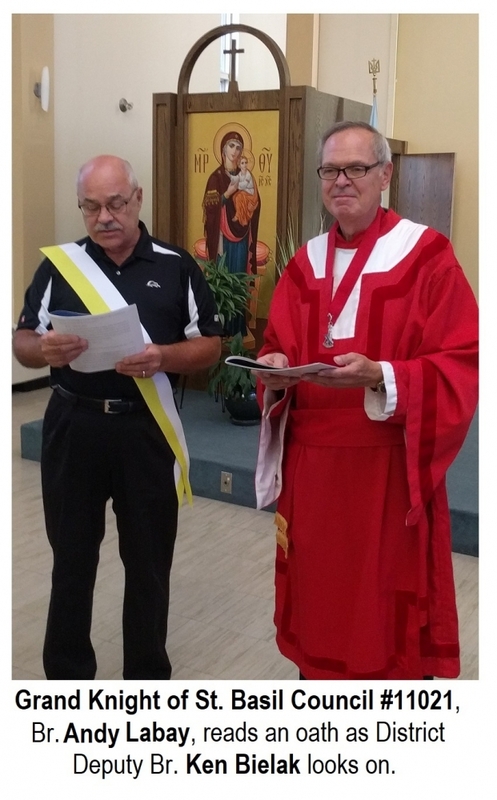 Michael Kwiatkowski, with the assistance of Deacon Leon Twerdun, celebrated the Divine Liturgy. As the following day would be the feast of the Nativity of the Mother of God, he asked that they take the propers for the feast. This way they would not only begin their year with the Sacrament of the Holy Eucharist, they would also honour the Mother of God who is also very central to the spirituality of the Knights of Columbus. At the homily, Fr. Michael asked the Knights to recognize the signs of the times and understand that it is a time that they will be called upon, and already are, to shine as witnesses for the teachings of the Church of Christ and to defend the faith as they have pledged to do as Knights. Following the Liturgy, Sir Knight Ken Bielak, Deputy for District 11, took charge of the installation ceremony. After an opening prayer and introductions, he called forward the council officers to be invested in the insignia of their respective office. In keeping with the Knights’ famous respect for the Church and her ordained leadership, the council Chaplain, Fr. Michael, was the first called forward. He was followed by the Council’s worthy Grand Knight, Br. Andrew Labay. The other officers were called up in turn. After concluding remarks and words of encouragement from the District Deputy, the ceremony concluded with a solemn blessing for the officers. As St. Basil Council #11021 has a lot of activity on the horizon, they delayed their fellowship celebration and went right to their first meeting of the new Columbian year!